The stiffest, more urgent challenge to President Kabila’s rule took place in major cities across the Congo today as members of the Catholic Church led protests against Kabila’s refusal to step down. According to the UN peacekeeping mission, 8 people were killed and 123 arrested when police and soldiers opened fire on protesters. These are initial figures that could rise; the country’s internet and SMS system was shut down in anticipation of the protests, and information has been slow to trickle out. In terms of sheer numbers, this repression was not as bloody as the January 2015 protests (at least 36 killed) or the September 2016 protests (at least 44 killed). Nonetheless––as we wait for more information––the symbolism was extremely evocative. Social media users have posted credible images of Catholics streaming out of masses, chanting and waving palm fronds in Kinshasa and Bukavu. 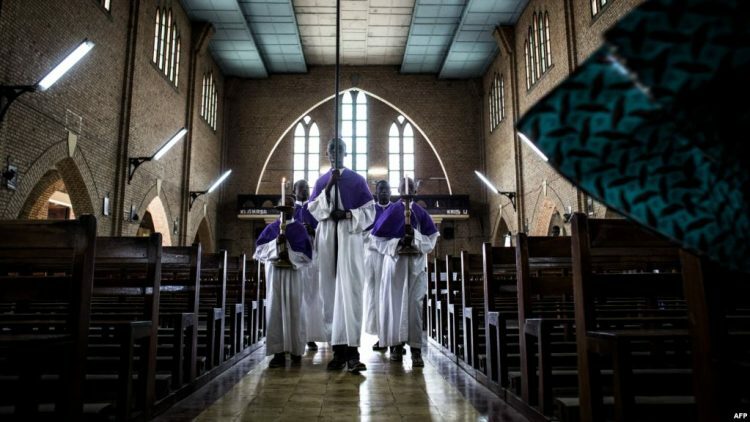 There are scenes of the faithful seeking refuge inside churches, with clergy filling fonts for holy water to wash out tear gas; there are unconfirmed reports of parishioners being shot inside and in front of churches (see here for gruesome images); and both Vital Kamerhe and Felix Tshisekedi, two leaders of the opposition were forced to leave masses due to tear gas. The protests raise several questions. After a series of protests that fizzled out before they could really start, these protests were widespread, mobilizing 160 parishes in the capital Kinshasa alone, the first substantial mass demonstrations since September 2016. While youth movements and opposition parties have struggled to mobilize people, lay Catholic groups, many with the backing of local priests, were successful, placing them at the center of contention to come. In other words: will the church and its affiliates continue to be in the vanguard of protest? The Vatican in the past has stepped back from becoming too politically involved. The protests also marked the end of the grace period given to Kabila to organize elections––a deal brokered by the Catholic Church had given the government until today to organize elections (these are currently scheduled for December 2018). Until now, diplomats and the UN Security Council had referred to this deal as the basis for Kabila’s legitimacy. That deal is now in tatters, and a large part of the Congolese political elite and electorate thinks Kabila is squatting in the office of the presidency in violation of the constitution (however, a constitutional court staffed by judges appointed by Kabila said he could stay in office until elections are organized). So will donors and the UN now simply shrug and say that despite this repression, the questionable constitutionality of this arrangement, and the lack of political consensus, elections for December 2018 are the only way forward? And finally, will the government’s argument about violent insurrection become a self-fulfilling prophecy? If the opposition thinks that it is impossible to mobilize people in the face of such repression, will some of them opt for violence? While very few of the current opposition leaders have any connection to armed groups, this is a plausible scenario that would mark a substantial turn in the conflict.